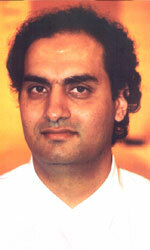 Puneet Nanda, the designer imbibed his creativity and design capability from his father, the famous artist, Satya Paul. Commencing from the year 1982 to the year 2001. Puneet moved from a gamut of design activities spanning photography, graphic design, textiles to finished garments and choreography of International Fashion shows for world famous designers. During his years in the design world in the Silicon Valley and in proximity to the Parisian designers, Puneet decided to explore the vast potential of digital design. He returned to India in 2001, enriched with experience, ready to re-launch the popular, chic and up-market Satya Paul brand with partners Jyoti Narula and Sanjay Kapoor. The Satya Paul Design Philosophy Appear as you are, Be as you appear… is the vision that drives the Satya Paul design team under the aegis of Puneet Nanda, Director Design. The Satya Paul team creates options for the intelligent, beautiful and sensitive individual of today. Designing garments with a global appeal in an ever changing and multifaceted color palette, Puneet Nanda comments, “The Satya Paul collection is an expression of joy and celebration for the woman who is feminine, inspiring intelligent and free spirited and clearly one who can make her own choices”.